Drupal is a free and open-source Content Management Framework (CMF) written in PHP and distributed under the GNU General Public License. That means it’s completely free to download, use, and modify. There are no purchase, license, or maintenance fees. Drupal is a CMS that allows communities to publish, share and manage a variety of content on a Web server. Content management systems (CMSs) provide a collaborative environment for social networking sites, corporate Web sites, intranets, community portals, eCommerce applications and discussion sites Communities range from a few users to tens of thousands. Drupal is modular and has dozens of add-ons that enhance its functionality and appeal, such as blogs, forums, newsletters, podcasting, photos, file uploading and downloading, collaborative authoring and e-commerce. As of September 2012, there are about 18,200 free community-contributed add-ons, known as Contribute modules, available to alter and extend Drupal’s core capabilities and add new features or customize Drupal’s behavior and appearance. Drupal’s default installation is a database-backed web platform with file maintenance tools and a high level of security. Drupal runs millions of websites, including many of the world’s biggest. It’s especially strong among major governments and industry- leading enterprises, but is easy enough to be the platform of choice for individuals and small companies. It is subject to rigorous security testing both by the Drupal community and by security experts around the world. Drupal’s core code has been proven to prevent common security vulnerabilities. It is also used for knowledge management and business collaboration. The standard release of Drupal, known as Drupal core, contains basic features common to content management systems. These include user account registration and maintenance, menu management, RSS feeds, page layout customization, and system administration. The Drupal core installation can be used as a brochureware website, a single- or multi-user blog, an Internet forum, or a community website providing for user-generated content. But extended with contrib modules there is no limit to build a powerful web application. Many developers take advantage of Drupal’s extensible architecture to go far beyond the “core” package. Drupal is a multi-user system, letting site visitors log in (as “authenticated” users) or browse the site without doing so (as “anonymous” users). You control their access levels, and can also assign “roles” for multiple permission levels. 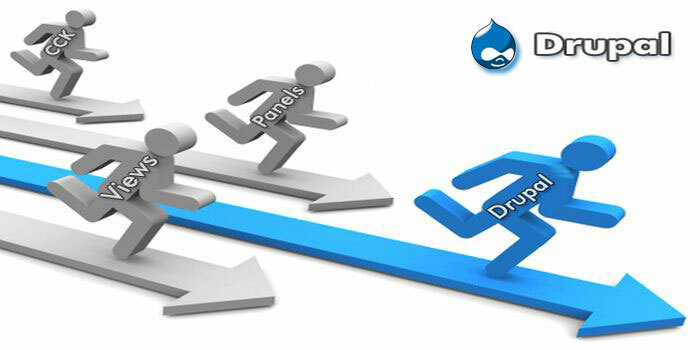 Drupal both hosts and promotes your content. It can reach out beyond your site to give you a presence on Twitter, Facebook, and in other venues. Drupal’s built-in features also give search engines what they want, improving your web impact automatically. Drupal site designs come from “themes”, whose visual presentation is described in standard CSS. Drupal.org hosts hundreds of free, fully customizable themes, including several “base themes” to help you launch your own designs. Drupal runs on any computing platform that supports both a web server capable of running PHP (including Apache, IIS, Lighttpd, Hiawatha, Cherokee or Nginx) and a database (such as MySQL, MongoDB, MariaDB, PostgreSQL, SQLite, or Microsoft SQL Server) to store content and settings. Although Drupal offers a sophisticated programming interface for developers, no programming skills are required for basic website installation and administration. Webform is the module for making surveys in Drupal. After a submission, users may be sent an e-mail “receipt” at the same time it sends a notification to administrators. Results can be exported into Excel or other spreadsheet applications. Webform also provides some basic statistical review and has extensive API for expanding its features. Some good examples could be contests, personalized contact forms, or petitions. Each of these could have a customized form for end-users to fill out. If a lot of customized, one-off forms are needed to be built, Webform is a more suitable solution than creating content types and using CCK or Field module. SEO (Search Engine Optimization).This module gives a granular control over the page title Specific patterns can be given for how the title should be structured and, on content creation pages. This also specifies the page title separately to the content’s title. It defines a slickgrid view style, so all data can be output as an editable grid. The Better Exposed Filters module replaces the Views’ default single- or multi-select boxes with radio buttons or checkboxes, respectively. Description fields and Select All/None links can be added to exposed filters to make for a better user experience. Ranosys Technologies has developed a various sites using the Drupal framework. Experience and knowledge gained during the development and implementations of these systems, makes Ranosys Technologies earn the badge of expertise in Drupal based systems. This makes the hardest task possible to fulfill. The development team at Ranosys Technologies works on providing all the functionalities and designing whether it is preparing a custom module, theme or complete Drupal implementation. The above mentioned modules and a lot more have been used by the developers in Ranosys Technologies to achieve excellent content management capabilities in the system.